Place bamboo skewers in a large dish with cold water. (This prevents splintering). Place ginger, garlic, honey, soy, curry powder, peanut butter and lime zest into a large bowl. Cut the lime in half and juice one half into the bowl. Mix well. Spoon 1/2 of the mixture into a small saucepan and set aside. This will be the sauce. Add the diced chicken to the marinade and using your hands coat all the chicken in marinade. Cover and refrigerate for 1 hour. While the chicken is marinating, add the coconut milk to the saucepan and gently heat over low-med heat, stirring continuously. 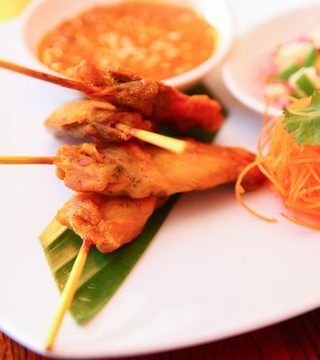 Remove skewers from water and begin threading the chicken onto skewers. Pre heat BBQ, spray with oil and cook for approximately 12-15 minutes or until all chicken is cooked through. Serve with sauce and rice. Cook pasta in a saucepan of boiling, salted water, following packet directions, until tender. Drain and set aside. Heat oil in a large frying pan over medium heat. Slice chicken breast into 1cm slices and add to pan with the onion. Cook for 5 minutes or until onion is soft. Add the spinach and tomatoes, cook, stirring, for 1 minute or until the spinach just wilts. 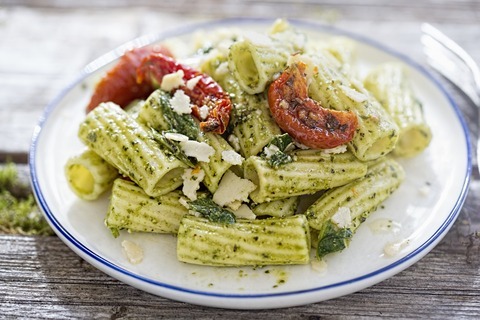 Add Pesto and cooked Penne. Add cream and cook for a further 5 mins, stirring. Serve topped with parmesan and green onions.